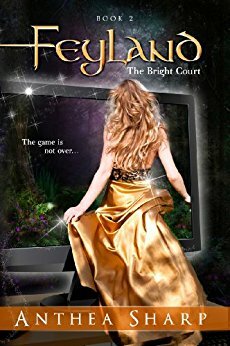 Jennet barely escaped the clutches of the evil Dark Queen of Feyland, with the help of Tam Linn in the Dark Court, but the game is still set to release. The land of faeries is still attempting to step through the boundary of Feyland to wreak havoc on our world. Roy, the son of the CEO of the game company provides another complication as he appears to glamor all those around him, except Jennet and Tam. Not only do they have to figure out a way to stop Feyland’s release, they now have to figure out a way to stop Roy and his illusions. I started reading this second book in the series as soon as I put down book one and it took very little time to get back into the magical realm of Feyland and the world and lives of Jennet and Tam. I was excited to see more of Marnie as she gets more time and importance as a friend in this second book. Of course, the growing friendship and budding romance between Tam and Jennet is also quite exhilarating to watch. I absolutely love slow to develop romances, especially ones based on more than just attraction. One of the greatest little details about this book (and series) is the fact that I see gender equality. The book isn’t all about the greatest female who must take upon herself the mantle of saving the world (almost every dystopian book ever). Feyland is more than just a female main character. Tam has as much action time and importance as Jennet. Then there is the fact that the CEO of the gaming company is a woman and the most famous celebrity simmer is female. Huzzah! Finally those in power and those in charge are not just male! And their genders didn’t even matter! I loved this second book and the ending was perfect. I can’t wait to read the final book in this series. This novel was published by Anthea Sharp on May 21st, 2012 and is available on Amazon here.